CleverInvoice – Smart Invoice System built using modern technologies only, such as PHP5, HTML5, Boostrap and jQuery. By using CleverInvoice, you can manage your/your company invoices, customers and products with a few clicks ! 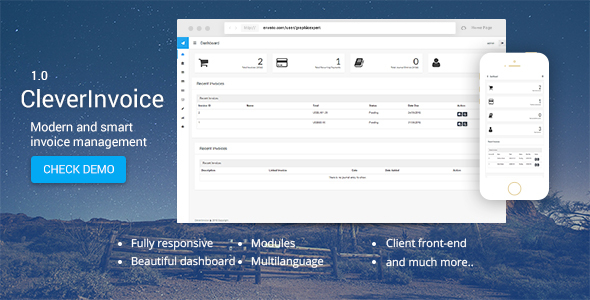 Responsive front and back-end Multilanguage Multi-currency Multiple payment gateways Accounting Invoicing Reporting Extendable using modules (coming soon) Tax rates And much more!